Keep illness-causing germs at bay with these simple tips. For many Canadians, the kitchen is the heart of the home. Unfortunately, it can also be one of the germiest places. Luckily, most bacteria are harmless, but some, like E. coli, Salmonella and Listeria, can cause serious illness. In fact, it is estimated that up to 4 million Canadians are affected by food-borne bacteria every year. The good news is that there are ways to thwart nasty germs and help prevent you and your family from getting sick. Warm, damp dishcloths and rags are a perfect breeding ground for bacteria. And wet and porous sponges are even more popular with our germy friends – researchers discovered that a single cubic centimetre of sponge can house more bacteria than there are humans on earth. Germ-fighting tip: While some might be tempted to boil or microwave kitchen sponges to kill bacteria, it’s better to replace them every week. Launder rags and dishcloths in hot water and dry on high heat. 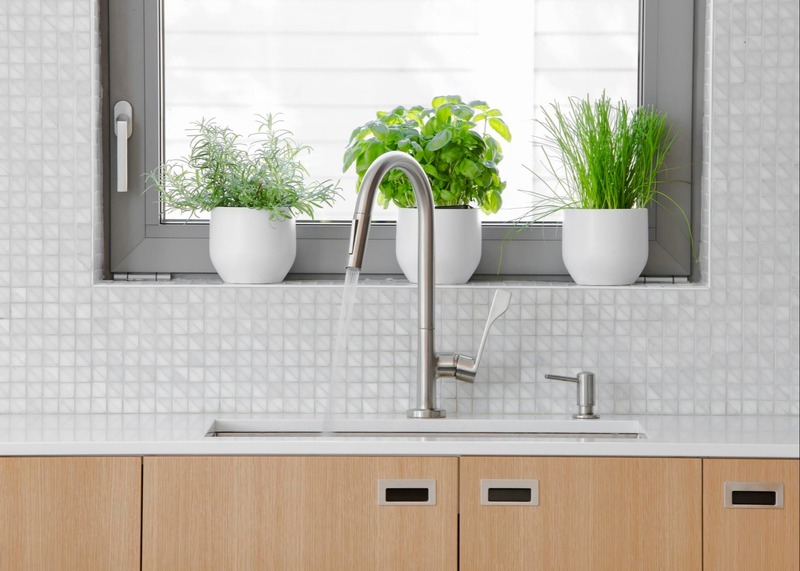 The sink harbours more bad microbes than any other location in the kitchen, except the sponge or washcloth. Dirt and bacteria from everything being washed end up congregating in the sink drain. And those rags and sponges mentioned earlier? They give bacteria a free ride all over the kitchen, including directly into the sink. Germ-fighting tip: After wiping down your sink with a clean rag, spray the drain, sink, taps and faucet with disinfectant. A solution of vinegar, water and soap does the job nicely. It’s likely that food is not the only occupant of your fridge – there could be a whole army of germs having a party in there. While it’s impossible to get rid of all bacteria, keeping your refrigerator at the right temperature helps – generally 4˚C or lower in the fridge and –18˚C or lower in the freezer. When storing cooked leftovers, it’s best to allow very hot food to cool in shallow containers at room temperature first. Once the food has stopped steaming, place it in the fridge uncovered until the food cools to the refrigerated temperature, then cover or wrap it tightly. Cooked leftovers should be refrigerated within two hours. It’s also a good idea to go through your fridge on a regular basis and toss out any old or expired foods. Germ-fighting tip: Clean your refrigerator once a month with hot soapy water and dry it thoroughly with paper towels. You can also disinfect it with a mix of vinegar and water. Almost any kitchen gadget or utensil will play host to bacteria and can easily spread them around if not used or cleaned properly. Germ-fighting tips: Use separate cutting boards for produce and raw meat. Sanitize countertops, cutting boards and utensils before and after preparing food – wash them with hot, soapy water, then use vinegar for an effective disinfectant. Can openers can be cleaned with hot soapy water and air-dried, or put in the dishwasher to sanitize. To clean the blades in a blender, fill it halfway with hot water, add a drop of dish soap, and hit the blend button. Rinse and let air-dry. Change the water in your coffee maker after each use and run vinegar through it for a thorough clean. And last, but certainly not least, wash your hands frequently with warm, soapy water for at least 20 seconds. After all, your hands are probably the most frequently used tool in your kitchen. Manulife Securities related companies are 100% owned by The Manufactures Life Insurance Company (MLI) which is 100% owned by the Manulife Financial Corporation a publically traded company. Details regarding all affiliated companies of MLI can be found on the Manulife Securities website www.manulifesecurities.ca. Please confirm with your advisor which company you are dealing with for each of your products and services. Stocks, bonds and mutual funds are offered through Manulife Securities Incorporated. Insurance products and services are offered through Focused WealthCare Services Inc.. Banking products and services are offered through referral.